It started with a thought. And for the past 8 months that’s all it was. It wasn’t even a constant thought as I would go weeks or much longer without thinking about running the Mason-Dixon Trail. I had three hundreds on my schedule that took all of my time and attention. I then had my first 100k to plan and prepare for. Afterwards, there was a focus on whether I was injured. But slowly my mind wandered back toward idea of running 199 miles in one go outside of a race environment. I’m still in the intrigued, but not quite committed stage though so my current actions toward this goal are more baby steps than anything else. Step 1. I moseyed over to the trail website and started doing a little research. The site has tons of information available on it and I began reading everything I could on water and food resupply options. Step 2. This quickly led to the creation of my MD-T FKT spreadsheet. No adventure is possible for me without a spreadsheet. I’ve only started outlining what I would require from an organizational standpoint and the complexity of this type of endeavor is rapidly becoming apparent. Step 3. I bought the trail maps. This is the big one for me. The other 2 steps are just messing around with my free time, however I’ve now shelled out my hard earned cash (all $16 of it) towards this thought. 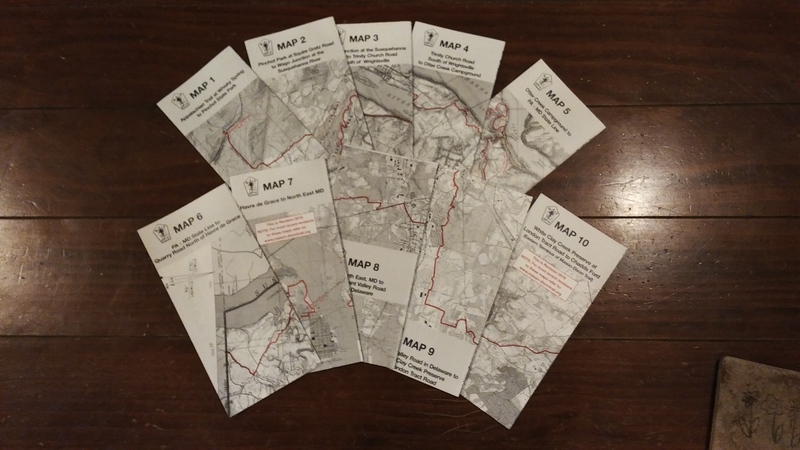 I’m not going anywhere without the maps, but now that I have them. . .
Includes 199.4 miles of turn by turn directions like “Pass Big Rock on left; reach woods road and pass concrete cistern on right”. Listen, it’s not a done deal that I’m going to attempt this (and if I keep repeating this over and over again maybe I’ll start believing it). I’m attracted to the idea of going for a Fastest Known Time (FKT) because it’s close (I live about 10 minutes from the trail’s eastern terminus), it’s a huge step outside my comfort zone (double my longest distance), but there’s a decent chance I can get the FKT because there is no self-supported record at present. So all I would need to do is just finish it to be first, which is something I’ll never be able to achieve in a standard race format. Though it’s possible I’m being extremely unrealistic to give myself a “decent chance” of finishing because it’s not like running/walking/crawling 199 miles is the same as running 100 miles, which I’ve done 7 times. My guess is that the jump from 100 to 200 miles is similar to the jump from 50 to 100. It took me 2 tries to bridge that gap. Add in the additional challenge of doing it with no support or aid stations along the way and the degree of difficulty only increases. And it’s this logistical challenge that really draws me in. I need to figure out what I’ll need, when I’ll need it, and how I can get it. I need to educate myself on the trail. I’ll need to train myself to cover the distance. I’ll have to decide the best time to attempt it. The number of unknowns at this point are just . . . well, unknown. Which makes even thinking about this very scary because failure is a very real possibility (and I don’t like to fail). So like any good little Type A personality, I’m going study and research and document and learn whatever I can about running 200 miles by myself before committing to the attempt. And at some point, I will cross over from evaluating whether to make the attempt to planning to make the attempt. The decision will occur in my deepest subconscious and will only slowly rise to the front of my conscious mind over a period of weeks, months, or years. Or maybe it’s already occurred and I just don’t know it yet.